Save The Colorado: April Newsletter — take a look! Hi Friends, Members, and Supporters of Save The Colorado! Thank you for your past support and membership! Generous donations from you make our work possible! First, we had a great victory two weeks ago! 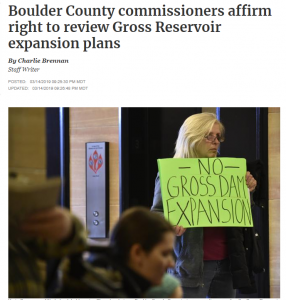 The Boulder County Commissioners in Boulder, Colorado, voted unanimously to force Denver Water through a “1041 Permit” process for the massive proposed expansion of Gross Dam in Boulder County. The project would be the tallest dam in the history of Colorado and the biggest construction project in the history of Boulder County, all to further drain and deplete 15,000 acre feet of water (4 BILLION gallons) out of the headwater streams of the Colorado River every year and pipe it under the continental divide to further slather water on lawns in the Denver metro area. Your voice was critical in this success – you sent the Commissioners over 1,000 emails, and many of you locally showed up to testify at the hearing. About 250 people attended the hearing with a standing-room only crowd in the Commissioners’ room and the overflow room next door, with testimony lasting 4 hours. The massive Gross Dam project is now completely mired in uncertainty. As Denver Water goes through the 1041 permit process, opposition to the dam will only continue to grow in Boulder County. The “1041 permit process” is mandated by state law in Colorado, and is a lengthy, technical process that requires Denver Water to now include the submission of detailed specifications concerning the impacts of the project on Boulder County’s environment and citizenry. The permitting process could take over a year and could result in court challenges from either side. “Boulder County and the people of Boulder County should not be a sacrifice zone for Denver Water’s river-draining schemes,” said Gary Wockner, director of Save The Colorado. Save The Colorado, and other environmental co-plaintiffs, have already sued the U.S. Army Corps of Engineers for granting a permit to the Gross Dam project. That litigation is pending in federal district in Denver and won’t likely be decided for another year. 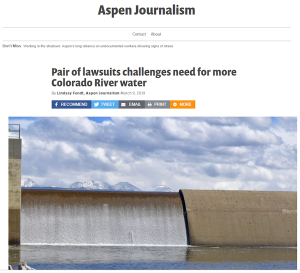 Other News About Our Work: In Colorado, our lawsuits to fight the “Windy Gap Firming Project” as well as the Gross Dam Project continue to make news as they work their way through the federal court system. We expect to see a court decision on the Windy Gap Firming Project lawsuit in 2019, while the Gross Dam lawsuit probably won’t be decided until 2020. Taken together, these two projects would further drain over 12 BILLION gallons of water out of the Upper Colorado River on average every year. We’ve dug in our heels against them using the full force of the law. Your support helped make this happen. We will continue to push forward every opportunity to drain this Lake and restore the Colorado River through the Grand Canyon – stay tuned for more news on this issue! 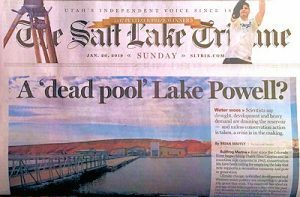 Finally, we continue to fight against proposed dams in western Colorado on the White River, in Wyoming in the Green River system, and the disastrous proposed Lake Powell Pipeline in Utah. We say it all the time, but it always needs to be repeated: It’s simply insane to be further damming and draining the Colorado River. We’ve held firm to that policy over the last ten years, and our actions back it up with the resources you contribute to us. Colorado River Update — FIVE GOOD NEWS STORIES!